Zerodha is known to bring technology innovations in the field of share market investments and trading in India. 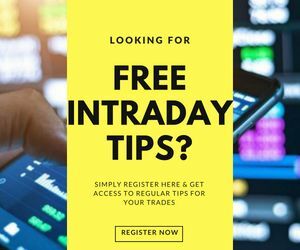 They have now developed a habit of introducing new trading platforms on a regular basis. 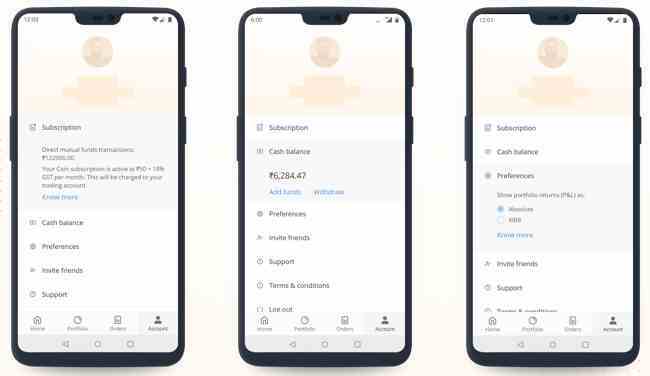 This time they have come up with Zerodha Coin Mobile app i.e. 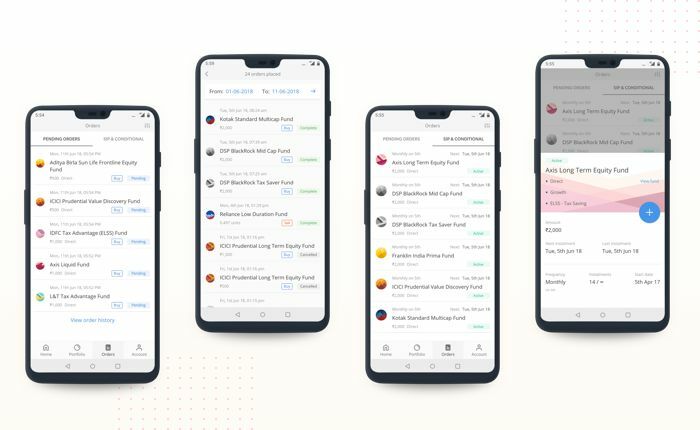 a mobile version of the existing Zerodha Coin Web platform. If this feels new to you, then just to give a quick background – Zerodha Coin is a direct mutual funds investment platform that was introduced by the discount broker in April 2017. You don’t need to pay any hefty commission charges to any agent with this model and there is a fixed charge (₹50 per month) that is applied on your mutual funds’ investments irrespective of the total amount you have invested. 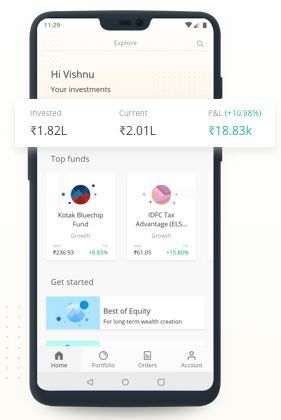 Now, with Zerodha Coin Mobile App coming into the picture, mutual funds investments should get even simpler. 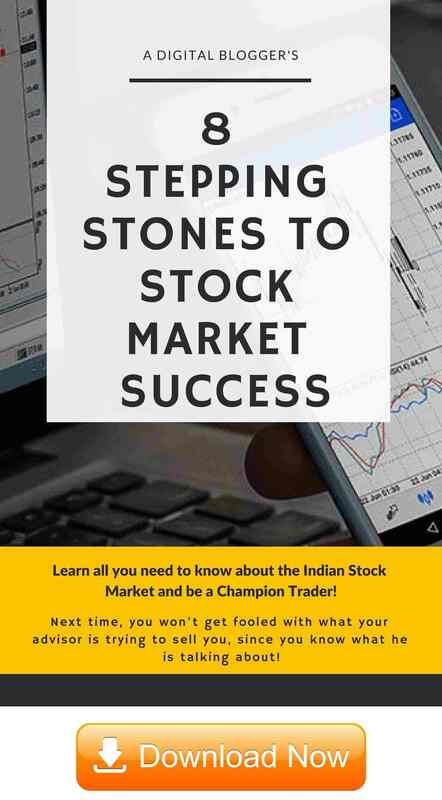 The app is available in both Android as well as iOS versions with the credentials same as Zerodha Kite (if you are already a client of the discount broker). At the same time, the discount broker may expect the total turnover to increase multi-fold from its existing scale of around ₹2000 Crore in a span of just a tad more than a year. The broker has opened the Mutual funds’ dematerialization option for free till 31st of October, 2018. 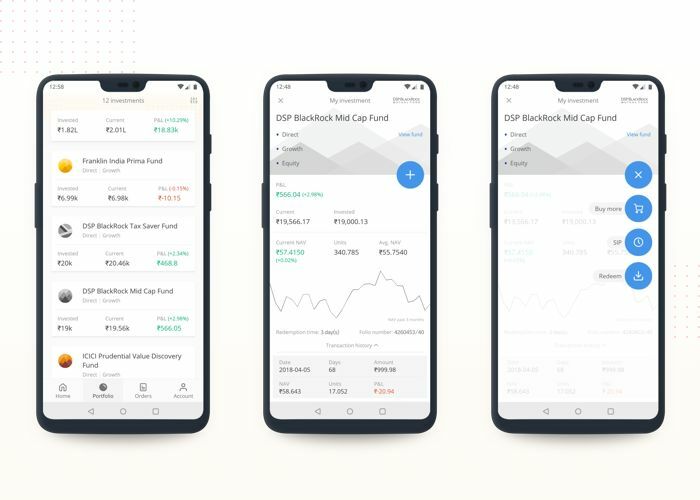 In this review, we will have a close look at some of the features, the overall investment journey within the Zerodha Coin Mobile app before we discuss the pros and cons of using this application for your investments. Below is the login screen of Zerodha Coin Mobile App where you just need to fill in your Zerodha Kite login credentials. If you do not have a Zerodha account yet, you can fill this Zerodha form and a callback will be arranged for you. Once you have logged into the application, the dashboard screen will be displayed to you. 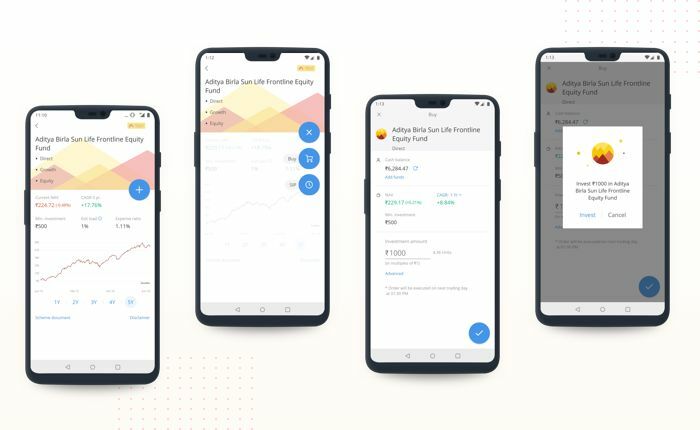 In case, you have already invested in some funds using the app, the screen will display your portfolio along with information on some of the top funds‘ other users are investing in. You will also be displayed funds from different categories (Equity, Debt, Tax-saving, Hybrid etc) to make your choice of funds easier. If you want to have a detailed look into your portfolio, all you need to do is tap on the ‘Portfolio‘ section among the 4 listed options at the bottom part of the screen. The portfolio screen will list out all the mutual funds you have chosen to invest in along with the current valuation of your investments. Apart from that, within the portfolio section, you can check specific details about each of the investments you have made along with the P&L position at each fund level. The functionality gives information on other aspects such as Current NAV, Average NAV, units etc. 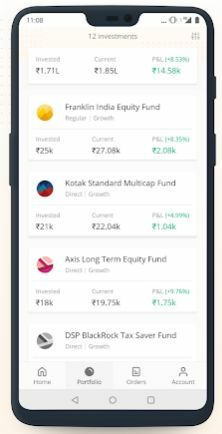 In case you are not sure which fund to go ahead with, but have some basic requirements in your mind – you can go ahead and use the ‘Search’ feature available in this Zerodha Coin Mobile App. To access it, you need to tap on the ‘Search Icon’ displayed at the top right part of the screen. With that done, you will need to put in your criteria in the filter and corresponding funds will be displayed to you. You may choose to apply one or more such filters and based on what values you select, corresponding mutual fund options will be shown to you. Once you have figured out the fund you are looking to invest your money into, the actual transaction process has been designed very smoothly as well. Before making an investment, you need to choose the mode of investment i.e. are you looking for a lump sum (one-time) investment or you are more comfortable with regular SIPs (Systematic Investment plans). SIP also implies regular transactions made at a set frequency. For a SIP-based mode, you need to decide the frequency before finally entering the amount you want to invest. If you wish to transfer funds into your account, the discount broker has set a provision to use either of Tez, UPI or direct net-banking for online transfers. The below-displayed GIF gives you a quick look at the complete fund transfer process. For someone who is looking to track his or her investments, you can access the ‘Order History‘ section and find the status of pending investments along with your investment history in this section. 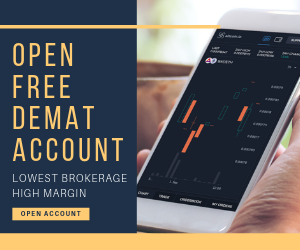 Finally, you can access your account and change any specific settings such as returns preference (in absolute or XIRR format), transfer funds using different methods, check cash balance, etc using the ‘Account‘ tab from the bottom part of the screen. 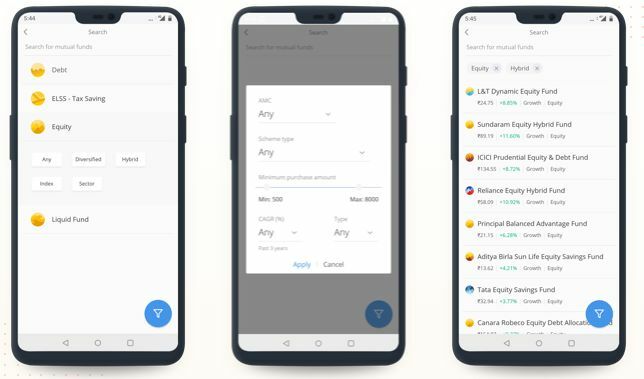 Apart from the above-mentioned features, Zerodha Coin Mobile App allows you to modify or cancel your orders as well. 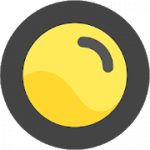 That is, in case you are looking to edit the SIP amount or the SIP frequency or both – that can be done easily within the mobile app. You may choose to even Pause or Cancel the SIP as well. 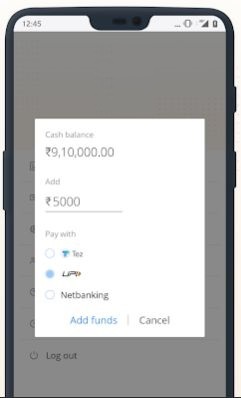 Then, if you are looking to withdraw your funds from the investments you have made, you just need to access the ‘Accounts’ tab, click on ‘Cash Balance‘ feature and you will be redirected to the Zerodha Q platform for the further withdrawal process. 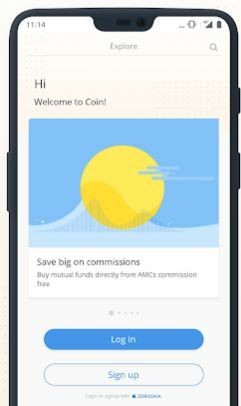 Since Coin is a direct MF app, there are no direct funds available for investment. No auto-debit option introduced yet which can be helpful for investors putting in SIPs. Auto-sign out not present in the current version. NRIs cannot invest using this mobile app. A well-designed user-interface with seamless user-experience. No need to pay hefty commission charges to any agent. Intuitive mobile app and even beginner level investors can easily understand the overall navigation. Smooth fund transfer functionality with multiple options to perform the operation. The initial investment of up to ₹25,000 requires no fees and is free. In case you are looking to get started with investments, just fill in the form below. I have started buying direct mf but not clear how to shift from one fund to another?please explain?